By Melissa Lennig on July 24, 2013 13 Comments. This content contains affiliate links. As an Amazon Associate I earn from qualifying purchases. Happy, happy news! I have a brand new niece, Baby R! She is simply adorable with a head full of floppy brown hair and lovely bright blue eyes. I can’t wait to make her bows and felt food, and generally, spoil her rotten! I’m starting with Texture Blocks, handmade with love just for her. So yes . . . this means that on this blog of mud, bugs, and superheroes, you will begin seeing tutus and pink. 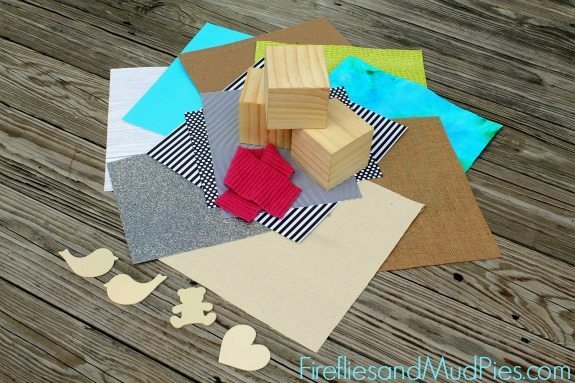 Texture Blocks are pine wooden blocks, decorated with a wide array of fabric, wood, and paper. They are like touch-n-feel books, but in block form! I purchased all of the supplies for my texture blocks from Hobby Lobby. Take your time when creating these blocks. I worked with just one side of a block at a time, then moved onto a different block while I allowed the other one to dry. 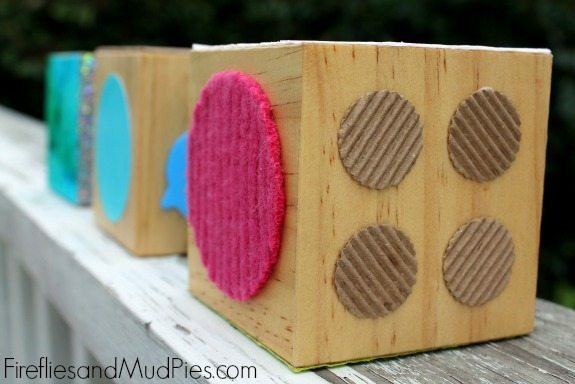 I used the paper punch and my scissors to cut circles and squares to glue onto the wooden block. 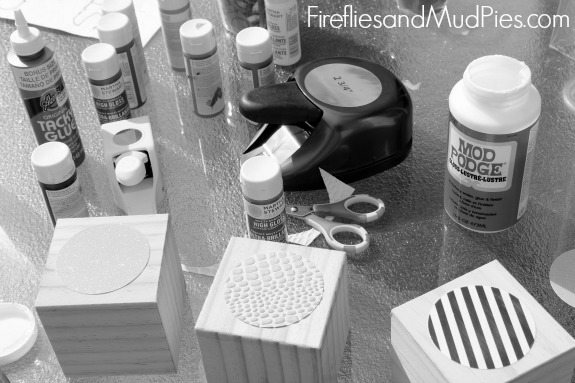 Every inch of wood was covered in Glossy Mod Podge, so the blocks have a nice shine that makes them appear finished and professional. I used the tacky glue to attach wooden cutouts (a blue bird and the letter R), and some of the thicker fabrics, like the wool cuff circle. I spread Mod Podge over the flat sheets of black and white paper, and over the burlap to prevent it from fraying. The blocks dried very fast! Babies and young children learn with their senses – that is why sensory play is so important! Parents can gently place their baby’s finger on one side of a texture block and share descriptive words like bumpy, soft, or scratchy. Stimulating a child’s senses helps their cognitive development and strengthens neural pathways for all types of learning. All sensory play, including Texture Blocks, should be supervised by an adult. When my boys were infants, they were excited by objects that were black, white, and sparkly! 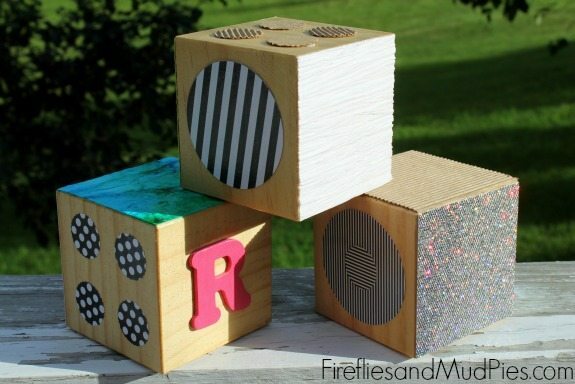 For Baby R’s set of sensory blocks, I chose sparkly grey, soothing greens and blues, neutral tones, black, white, and pink! 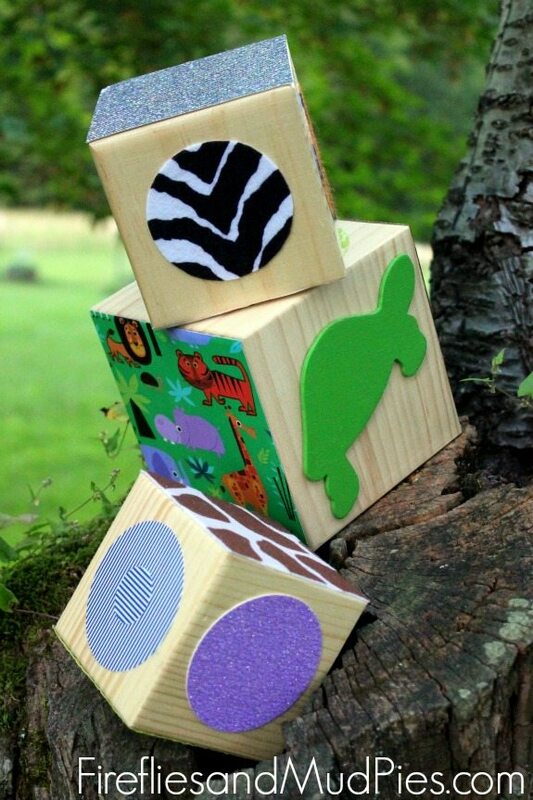 Texture Blocks can be personalized to a child’s nursery theme, such as the Jungle Themed Texture Blocks pictured below. 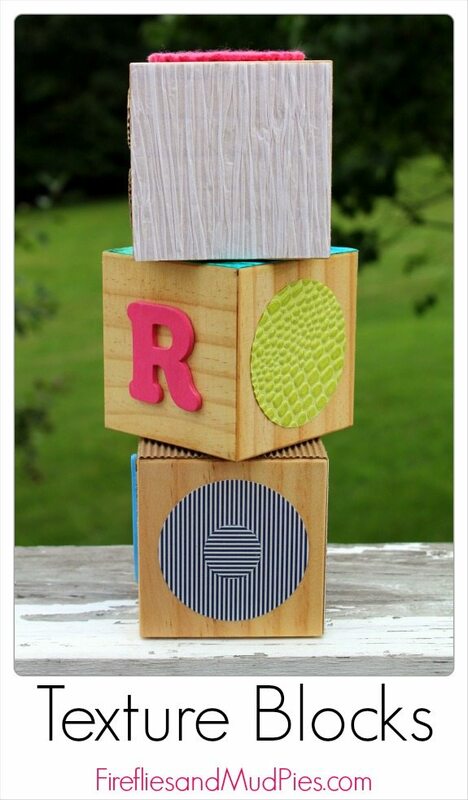 Texture Blocks are a handmade keepsake that will be enjoyed for many years. I can’t wait to watch Baby R play with them! 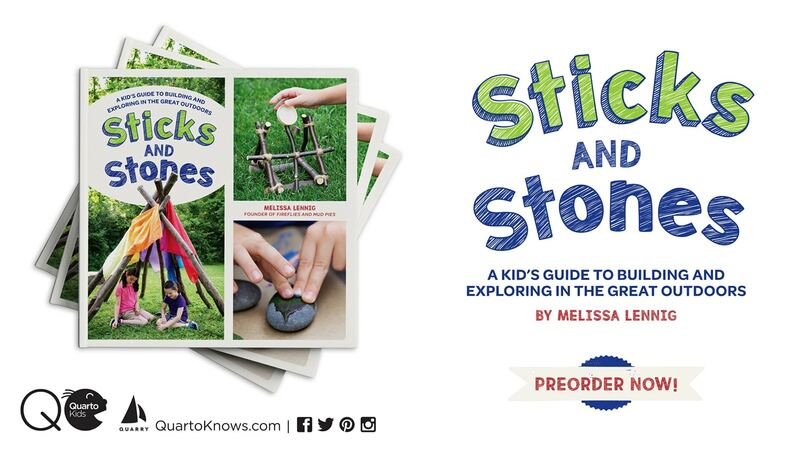 These are really awesome, Melissa! Thanks for sharing. You are welcome! And Krissy, thank you for your comment!